What does it take to be America’s best-selling compact pickup, year after year? It takes the Toyota Tacoma. For 2015, Toyota hones Tacoma’s segment-dominating ways by adding a new TRD Pro Series that’s off-road ready and willing. It’s what hasn’t changed that keeps the Tacoma on top of its game. With its many variations, the Tacoma appeals to a broad spectrum of pickup truck customers. The Tacoma line offers a choice between 4-cylinder and V6 engines, and 2WD and 4WD drivetrains, along with two cab styles and two bed lengths. 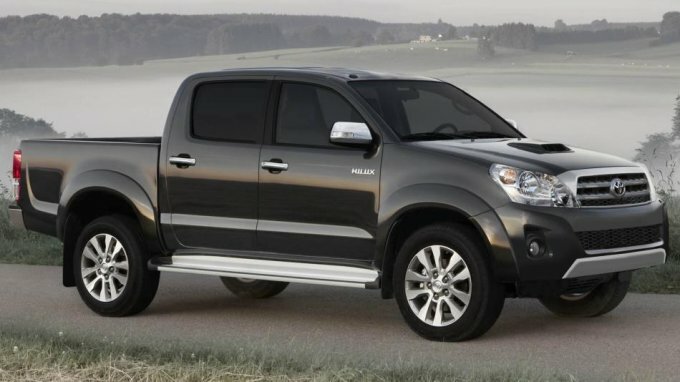 This hard-working, hard-playing pickup is built to take it and rewards owners with legendary Toyota quality, durability and reliability. Serious off-roaders have long favored the Tacoma as a basis to build their custom trucks. The 2015 Tacoma TRD Pro Series gives them a head start on their way to the desert. Replacing the limited-edition Tacoma Baja Series that was offered for 2014, the 2015 Tacoma TRD Pro Series adopts much of that model’s beefed-up body and chassis features, including 16-inch beadlock style TRD alloy wheels with BF Goodrich LT265/70R16 All-Terrain KO tires. Suspension mods make the Tacoma TRD Pro Series off-road ready, raising ride height 1.75 inches in front, increasing wheel travel and using TRD springs with decreased rate for better ride control over rough terrain. The front suspension, which adds 0.75-inch wheel travel, is upgraded with 60mm-piston Bilstein high-performance shocks with remote reservoirs to increase shock oil capacity for greater heat dissipation and damping sensitivity. The rear suspension is equipped with 50mm-piston Bilstein high-performance shocks with remote reservoirs, and the TRD springs add 1.5-inch to wheel travel. A TRD Cat-back Exhaust cuts backpressure and adds a sporty growl to the 4.0-liter V6 engine. And then comes the TRD Pro Series styling: black alloy wheels, unique blackout front grille, special TRD badging and a choice of black, white or exclusive Inferno exterior colors. Inside, the TRD shift knob and floor mats add a custom touch. At the opposite end of the spectrum, a new Utility Package for the 4-cylinder Tacoma Access Cab deletes the rear seats to expand storage capacity. Depending on equipment, the Tacoma can be anything from a sturdy work truck to an off-road bruiser, and there’s even a Limited Package for those who want a touch of luxury in a compact pickup. The 2015 Tacoma configurations are based on two cab types: Access Cab with rear seating and the four-door Double Cab Regular Cab has been discontinued). The rear-opening doors on Access Cab models open to 80 degrees to give passengers easy entry and exit. The Access Cab models ride on a 127.4-inch wheelbase and have a 73.5-inch-long bed. The Double Cab is offered in two versions: the 127.4-inch wheelbase with a 60.3-inch bed or 140.6-inch wheelbase with the 73.5-inch bed. Both bed styles are built to take punishment with a composite inner bed made from a sheet-molded composite (SMC) deck and tough, durable walls that are 10-percent lighter than steel. The bed deck features two-tier loading and an integrated deck-rail utility with four standard adjustable tie-down cleats. The rails are compatible with Genuine Toyota Accessories, including cargo bed cross bars, a fork-mount bike rack, and diamond-plate storage boxes. An available 115V/400W power point further extends the bed’s utility. PreRunner models sport the desert racer look by combining the 4×2 drivetrain with the 4×4’s raised riding stance and styling, including the bold overfenders. Double Cab models offer a roof rack system with crossbars that deploy from the roof rails. The SR Package, available for the Tacoma PreRunner and 4×4 base grade models, lends a sporty look with a color-keyed exterior appearance upgrade, including overfenders, door handles, bumpers, grille surround and mirrors with turn signals, plus smoked headlight lenses and a black finish 16-inch Baja wheel style. Models with the V6 engine also get fog lights with the SR package. Also presented in Elderlytech. The Tacoma continues to offer the standard 2.7-liter dual overhead cam (DOHC) 4-cylinder, producing 159 horsepower and 180 lb.-ft. of torque, and the 4.0-liter DOHC V6 belting out 236 horses and 266 lb.-ft. of torque. In both engines, variable valve timing with intelligence (VVT-i) ensures strong low-end and mid-range torque. Four-cylinder models offer the choice of a 5-speed manual or 4-speed automatic transmission. The V6 can be teamed with either a 6-speed manual or a 5-speed automatic. When equipped with a V6 Tow Package, Access Cab models boast a SAE-certified maximum tow capacity of up to 6,500 pounds. With all Tacoma models, there’s a standard Automatic Limited-slip Differential (Auto LSD), which uses brake intervention to help reduce tire slippage at the rear wheels. Compared to a conventional mechanical limited slip differential, the Auto-LSD system is much more responsive and has better wear characteristics. An electronic locking differential is also available as an option for 4×4 and PreRunner models. The choice between two TRD performance packages reflects the broad range of Tacoma’s capabilities and appeal. The TRD Off-Road Package, available for 4×4 V6 automatic models, provides a carefully tuned balance of off-road performance and on-road handling. The package starts with a slew of chassis modifications, including an electronic locking rear differential, progressive-rate front springs, specially tuned Bilstein shock absorbers, a 28-mm front stabilizer bar and BFGoodrich Rugged Trail tires. The package includes two other electronic helpers, Hill-start Assist Control (HAC) and Downhill Assist Control (DAC). HAC operates by independently controlling the brakes at each wheel as needed to help prevent the vehicle from rolling backward or slipping sideways when transitioning from a stopped position to climbing a grade. DAC uses engine braking to regulate downhill speed and independently control the brakes at each wheel to help improve directional control. DAC automatically de-activates if the driver depresses the brake or accelerator pedals, presses the DAC button, or shifts into neutral. Fog lamps top off the Off-Road Package. The TRD Sport Package combines a sporty look with a more road-focused chassis upgrade. Fog lamps, a hood scoop, TRD graphics and color-keyed rear bumper, mirrors, grille surround and door handles give the Sport Package a rugged yet sophisticated appearance. The Sport Package’s specific suspension tuning and lower-profile 265/65 R17 tires on 17-inch alloy wheels give it a handling agility edge. Both the TRD Off-Road Package and Sport Package feature a 400W/115V power point in the bed; sport seats with adjustable lumbar support, and water-resistant fabric protection seats. The comfortable Tacoma interior is full of practical ideas. The standard center console flows into the instrument panel for a unified appearance. The console integrates three cupholders, two of which can accommodate extra-large containers. The front doors have dual bottle holders. High-grade fabric combines comfort and durability. And the Tacoma keeps things quiet, thanks to sound absorption material in the headliner and behind the rear seats, along with insulating carpet. Audio controls are mounted high for easy access. Higher-grade models feature fabric-covered sun visors, an overhead console with map lights, and compartments for sunglasses and a garage door opener. Interior storage is maximized in Access Cab models with fold-up rear seats and under-seat storage. Double Cab models feature 60/40 split rear seats with adjustable headrests and under-seat storage. Legendary Toyota value is another Tacoma trump card. The 4×2 Access Cab and Double Cab models feature standard air conditioning; two instrument panel power points with a lighter; dome lamp, mudguards, a full-size spare tire and Entune® Audio. There’s more, including power windows and door locks; front bucket seats, and a center console. The Double Cab models add power mirrors and driver seat adjustable lumbar support. Access Cab models feature a useful rear-console storage box and an available backup camera. Working hard or playing hard, there’s nothing wrong with added comfort, and the Tacoma’s Limited Package adds just the right degree. You’ll know a Tacoma Limited when you see it. It’s the one decked out with chrome for the 18-inch wheels (with 265/60R18 tires), grille surround, rear bumper, outside mirrors with integrated turn signal indicators, and door handles. The package also includes fog lamps. Its amenities include SofTex®-trimmed seats, heated front sport seats, variable speed windshield wipers, metallic tone instrument panel trim, leather-trimmed steering wheel with audio controls and dual sun visors with mirrors and extenders. SofTex is soft like leather, but weighs half as much. It’s also easier to clean, and its manufacturing process generates around 85-percent fewer volatile organic compounds than manufacturing conventional synthetic leather. Standard on the Limited grade and available for the SR5 grade, the Entune Premium Audio system adds Navigation and the Entune App Suite. The base Entune Audio system for Tacoma uses a 6.1-inch touch-screen display with a rear-view camera, AM/FM CD player, MP3/WMA playback capability, four speakers, auxiliary audio jack, USB port with iPod® connectivity, hands-free phone capability and music streaming via Bluetooth® wireless technology for audio streaming, hands-free phone use and phone book access. Available Entune Audio Plus adds a high-resolution 6.1-inch screen, HD Radio with SiriusXM Radio (includes 3-month complimentary trial), iTunes® tagging and HD Traffic and Weather (metro areas only). Entune Audio leverages the user’s smartphone to provide a richer in-vehicle experience with fully integrated access to navigation, entertainment and information services. The Entune Premium Audio and Entune Premium JBL® Audio systems feature engaging mobile apps, including Bing™, iHeartRadio, MovieTickets.com, OpenTable®, Pandora®, Yelp and Facebook Places plus real-time traffic, weather, fuel prices, sports and stocks. Access to Entune services is subscription free. At the top of the line, the Entune Premium JBL Audio system upgrades the sound quality considerably with the JBL GreenEdge™ amplifier and seven GreenEdge speakers including subwoofer. GreenEdge technology draws reduced electrical power from the vehicle. The Tacoma offers plenty of choices when it comes to individualizing a truck, yet Toyota makes it easy by offering five core packages: Convenience Package, two levels of the SR5 Package with other options and two TRD Packages, Sport and Off-Road (described earlier). The SR5 Package bundles styling and comfort features, including color-keyed overfenders and front bumper, chrome grille surround and chrome rear bumper. The package also adds intermittent wipers and upgraded interior features and trim, including a leather-wrapped steering wheel and automatic transmission shift lever. Toyota dealers offer a wide array of accessories, including TRD performance components, that expand Tacoma’s utility, comfort and driving fun. Standard on all Toyota models is the Star Safety System™, which includes Vehicle Stability Control (VSC), Traction Control (TRAC), an Anti-lock Braking System (ABS), Electronic Brake-force Distribution (EBD), Brake Assist (BA), and Smart Stop brake override technology (SST). Every Tacoma has standard three-point seatbelts for all seating positions, front seat-mounted side airbags, roll-sensing side curtain airbags (including a cutoff switch), and a front advanced dual-stage airbag system. A front passenger cutoff switch is standard on Access Cab models. Standard active headrests for the front seats move up and forward almost instantly in the event of certain rear-end collisions to help reduce the distance between the occupant’s head and the headrest. Toyota’s 36-month/36,000 mile basic new-vehicle warranty applies to all components other than normal wear and maintenance items. Additional 60-month warranties cover the powertrain for 60,000 miles and corrosion with no mileage limitation. The Tacoma also comes standard with Toyota Care, a complimentary plan covering normal factory-scheduled maintenance and 24-hour roadside assistance for two years or 25,000 miles, whichever comes first.